I just finished A Fine Balance, by Rohinton Mistry, and read What is the What, by Dave Eggers just a few months ago--two books that visit the most sickening scenes of human cruelty that can be imagined. My response to them was quite different. 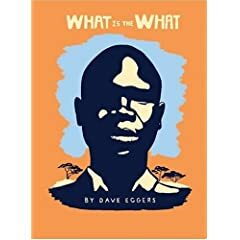 With all the detail of fiction, What is the What tells the true life story of Valentino Achak Deng, who was violently separated from his family as a boy of seven, miraculously walked 200 miles out of Sudan, and spent the next thirteen years in refugee camps. Unimaginably awful things happen along the way, and then more terrible things happen when Valentino comes to Atlanta. One of the themes touched on very early in the book is the way that Americans react to all of these horrors. Some of us aren’t sufficiently interested in far away places like Sudan to find out about people like Valentino—that, interestingly, is the attitude of many in the black community, or so the novel suggests. Others are earnest do-gooders, dying to know all the details, almost thrilled by the depths of our horror and compassion. Valentino is ever so grateful for these people, but finds them a bit hard to fathom. Why do they get involved with a helpless bunch of orphans who can’t do much of anything to reciprocate? The portrait of the do-gooders is intriguing, but no deterrent. I imagine there are very few people who read this book and go on to do nothing for the many Lost Boys who now live in this country, and nothing in response to the present tragedy in Darfur (western Sudan). For something to do about Darfur, see the links section on this page. Anyhow—I loved this book. As painful as it was, it was not unbearable. And now that I’ve read A Fine Balance, I think I see why. For one, it’s about a real person, and so you can’t possibly resent the author for piling such an amazing number of misfortunes on one ever-so-nice person. It happened! Another thing that keeps the reader from flinging the book down is that Valentino is the book’s narrator. As a result, we know through all the horrors that things will end at least reasonably well for the one person in the book we really get to know. No matter what happens, his path will lead to this amazing partnership with the virtuoso writer Dave Eggers. The book also shifts back and forth between a present that is awful, and a past that’s much worse. I think Eggers has lots of reasons for this structure, but I’m betting one is that he actually wants to help the reader. The time-shifts give the reader a bit of relief so he can bear to press on and hear what happened next in Sudan. A Fine Balance is set in India during the 1970s and follows the arc of four lives that are hemmed in by caste and class and disrupted by the Emergency measures of Prime Minister Indira Gandhi. This is a book about how very bad things happen to good people, and how some but not all of them remain good, or even become better; and about how bad people can be unbearably bad, and completely get away with it. It is periodically heartwarming and funny, but abysmally dark from beginning to end. I can’t imagine anyone getting to the end of A Fine Balance and feeling any attraction to cultural relativist apologetics. Yes, yes, caste is deeply a part of Hindu culture and religion, but that doesn’t place it beyond moral doubt. In fact, what’s undoubtable is that it’s one of the worst ideas any culture has ever come up with. Anyhow, as much as I think Rohinton Mistry is a fine novelist, I was intermittently angry with him throughout the book. While Eggers actually tried to stop his reader from feeling tortured by Valentino’s story, I felt like Mistry tried to maximize his reader’s torment. In this book, the narrator’s voice provides no assurance that anything will turn out OK for anybody, because the narrator is not one of the characters. The pile up of horrors in Egger’s book is astonishing but it’s just the truth; in Mistry’s book, by contrast, the pile up is a work of art. The timing of certain tragedies (which will go nameless—no spoilers ahead) is designed for effect. The impression I get is of a novelist whose rage against the social ills of India, and the government of Indira Gandhi, has been transmogrified into the misfortunes of his characters, and hence into the pain and indignation of thousands of readers. Holding this book in your hand, sinking back in your soft armchair, you will say to yourself: perhaps it will amuse me. And after you have read this story of great misfortunes, you will no doubt dine well, blaming the author for your own insensitivity, accusing him of wild exaggeration and flights of fancy. But rest assured: this tragedy is not a fiction. All is true. I like the fact that Mistry anticipated my reaction. I’m still thinking about whether his countercharge is fair or correct. Is Mistry cruel to his readers, or are the things he portrays—and those types of things are real enough—just cruel? Was I annoyed with him because of my own insensitivity?